When designing a website, most think about the “big picture” of what we want it to look like – the colors, layout, and visuals for example. While those aspects are important, there are key factors which contribute to your website’s SEO (or search engine optimization). SEO is the practice that helps your website be found through search engines. One of those key factors to your website’s SEO is your meta title. What is a meta title, and what is its purpose? A meta title appears on search engine results pages as the blue title and link to your website that specifies to Google, and the user, what your site is about. Every individual page on and in a website should have one. It is critical to use important keywords in your meta title. By putting a few top keywords into your title, you are providing accurate information for crawlers to determine what your site is about, therefore increasing your ranking and drawing the right audience into your website. One great way to start determining what some of your best keywords should be is to ask a few key questions: What is your webpage about? What question is the content on your webpage answering? Does my target search audience use specific words to talk about my content, product or service? When answering those questions, take note on what words you used in your answers. The keywords should stand out to you. So why is a meta title so important? Not only is a meta title key to capturing your audience’s attention, but it is read by crawlers, which scan your website. In short, a crawler is a program that scans everything it finds on the websites it goes to. Once the crawler grabs information, it stores all of it into a big online library called an index. When you go to your search engine of choice and search something (“drums” for example), that search engine will scan the index and pull up the pages that the crawlers have found relating to drums. 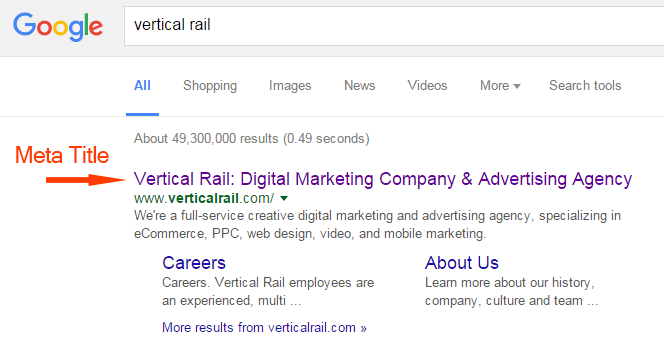 This is the main reason that keywords are so important. Those crawlers pick up on the keywords you’ve chosen, both in your meta title and content, and will base what it reads on where to index your web page in the results pages and determine its relevancy to the search provided by the user. Crawlers are one of the top technical reasons as to how much, or ultimately how little, traffic you will get to your website. What else do I need to know about creating my meta title? Presentation: Make sure you use the Title Case style when writing meta titles. That means that all of your major words are capitalized, with the exception of the small words such as “of”, “to”, “the” and so on. Just like you would any other title. Length: Most search engines will typically display the first 50-60 characters of your meta-title. By keeping your meta-title around the 55 character count, you can almost guarantee that it will show up in its entirety. This number also fluctuates based on character sizes; i.e., using a bunch of uppercase I’s verses uppercase W’s that take up more space… You get the idea. If your meta title goes over the character limit, it will turn into an ellipsis. The character limit varies based on different search engines, but is typically around the same count. If using a mobile device, remember that character count and display lengths may be limited, depending on the mobile device that is being used to utilize the search. Uniqueness: Since your website has different pages within your site, and by assumption the individual pages on your website will all contain unique content, each one should have its own meta title based on what that page is about. By using different meta titles, you are giving the viewer a better idea of what that unique page is about, as well as increasing the amount of keywords you use. In turn, this can provide the crawlers with more information to help your site be indexed at the top of the results pages.